Last week I enjoyed one of the most memorable meals in my life at 16 Restaurant at Trump Tower in Chicago. 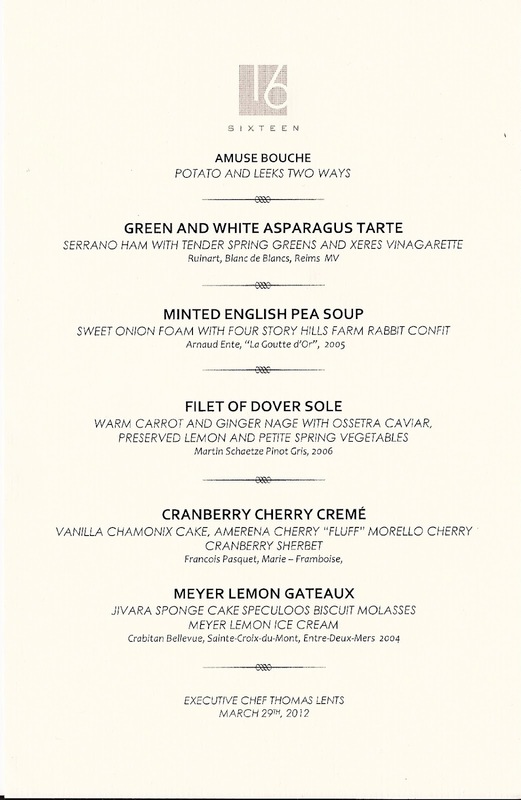 The new menu, which has been in place only a few weeks, is the creation of Chef Thomas Lents, who came to Trump from Joel Robuchon Restaurant at the MGM Grand Hotel in Las Vegas. In fact, Lents was the very first American to serve as chef de cuisine for Robuchon, which testifies to his talent as well as to why Trump wanted him as their chef in Chicago. Dining at 16 Restaurant is a pretty special experience to start with as this is a gorgeous cathedral-like room of high ceilings and glass that offer the diner spectacular views of the Chicago River and Lake Michigan; at that height, you're also face to face with the famous clock tower of the Wrigley Building. Visitors I've talked to at the restaurant love this panorama and as a life-long Chicagoan, I never tired of the view; it's just another small piece of evidence as to the remarkable beauty of our city. The previous meal I enjoyed here some five months earlier was excellent (read here); two courses with foie gras certainly added to my pleasure (and my waistline); service all around was attentive and I came away not only satisfied with my meal, but also thinking that here was a restaurant that deserved greater acclaim. Now after enjoying Chef Lents' cuisine, I am convinced this is an outstanding, perhaps great restaurant. The asparagus tarte is served with Serrano ham and has a tuile of parmesan as the base; the saltiness of the parmesan was a perfect foil for the Ruinart Blancs de Blancs. 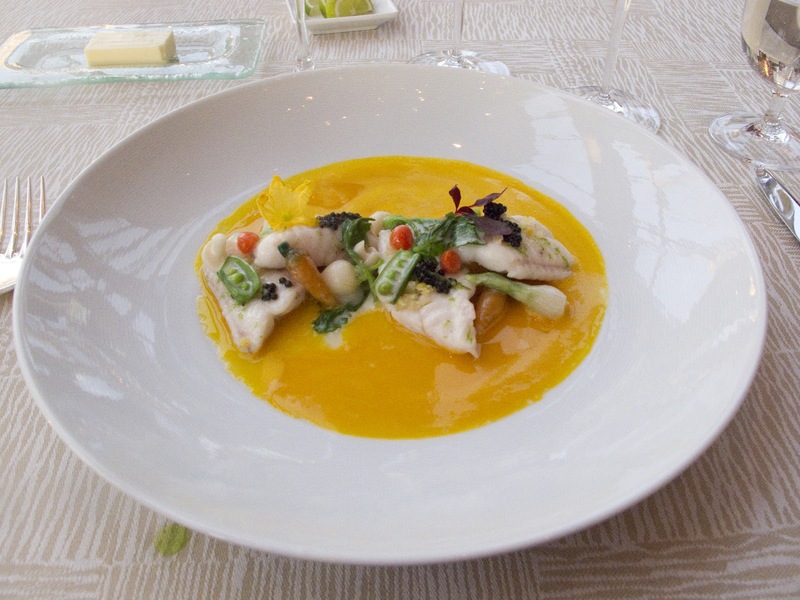 The combination of the rabbit confit served on small toast (which you eat with your fingers) with the pea soup meshed perfectly as did all the flavors of the dover sole with a carrot and ginger nage, served with Ossetra caviar and baby carrots. This is a spectacular dish that has a remarkable array of flavors, all of which harmonize beautifully in an entrée that is light as a feather. I gave wine director Rachael Lowe carte blanche in selecting my wines and as usual, she outdid herself. Her choice of the 2005 Arnaud Ente Meursault "La Goutte d'Or" with the pea soup was nothing short of brilliant, while her selection of a 2006 Martin Schaetze Pinot Gris (vibrant and powerful) was likewise inspired. When you dine at 16, you must take advantage of Rachael's extraordinary talent for pairing the proper wine with your food; she's great at it and she also happens to be one of the most engaging people I've met anywhere in this industry. 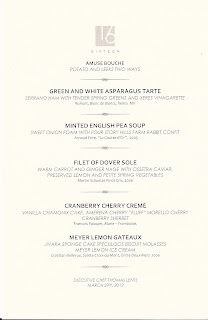 So congratulations to Chef Thomas Lents on his inspired cuisine and compliments to everyone at 16 Restaurant, as this was a great evening; the service was amazing - attentive and friendly with just the right attention to detail. In closing, let me say that I've dined at Michelin two-star restaurants in Europe; based on this meal, 16 Restaurant deserves those same two stars.